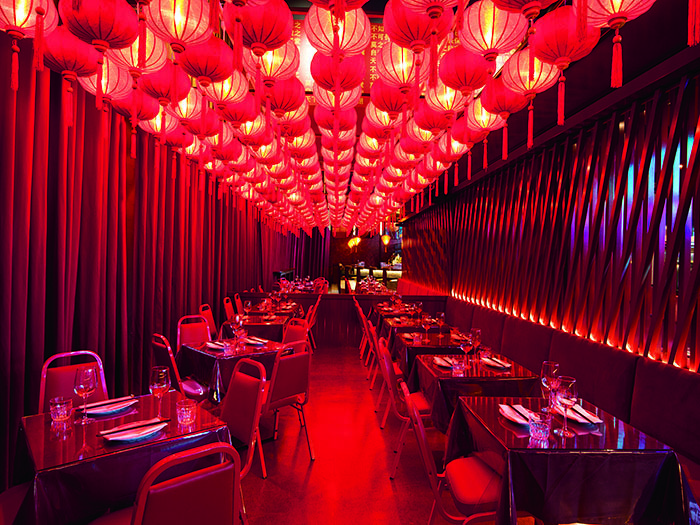 Ménard Dworkind Architecture and Design creates a striking interior for the Miss Wong Chinatown themed restuarant and bar in Laval, Canada. 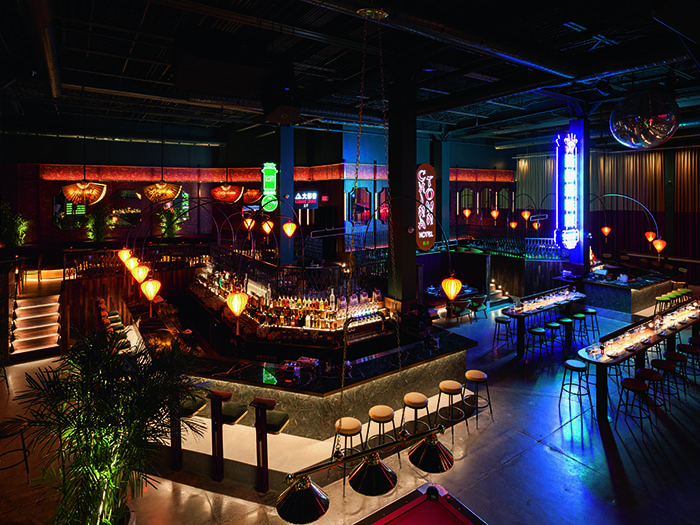 In Eastern Canada, close to Montréal, the city of Laval is host to the extravagant Miss Wong restaurant and bar. Named after the infamous Chinese-American actress from the 1920s-30s, Miss Anna May Wong, the charming restaurant appears to be more reminiscent of a 1980s San Franciscan Chinatown. Serving a Chinese, Thai, Vietnamese, Japanese and Cambodian inspired menu, the modern-fusion kitchen is run by Vietnamese-Montréal chef Phong Thach. Co-owner Dan Pham runs the restaurant/bar in partnership with Foodtastic restaurant group, which is mostly known for its Canadian chains. The dazzling interior design of bright neons, exotic Asian fan and paper lantern lights, red and jade décor and chic dining accessories was completed by Ménard Dworkind Architecture and Design (MRDK), a Montréal-based firm that specialises in commercial interiors, residential architecture and interior design. 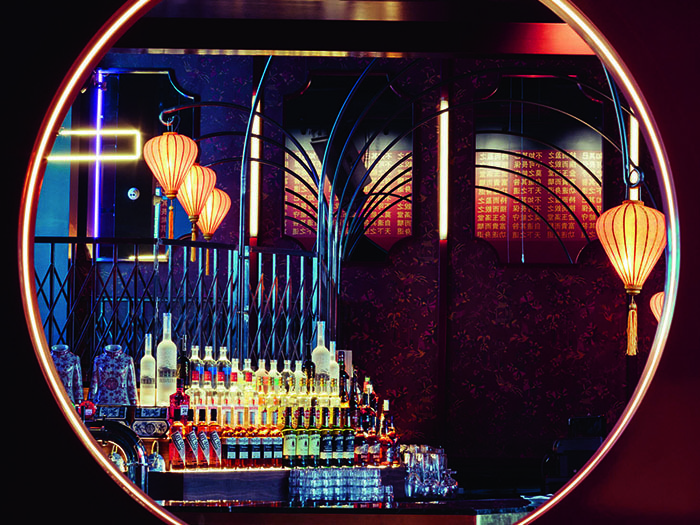 For the Miss Wong project, the team at MRDK brought in lighting design firm D’Armes and manufacturer Le Lampiste de Beloeil to create bespoke lighting fixtures to complete the cinematic effect. Dave Dworkind, of MRDK, explains the firm’s approach to the aesthetics of the space and the brief they had to work with: “The initial idea was to make a restaurant/bar with an American Chinatown feel. The project took three months for design and drawings and six months for construction. Firstly, it’s a 10,000sqft space with a 500-person capacity, so we needed to create different zone levels to make it more comfortable. The client wanted to be able to accommodate groups in more private spots, groups around the action of the bar, and plenty of two-seaters to be able to modulate the space. 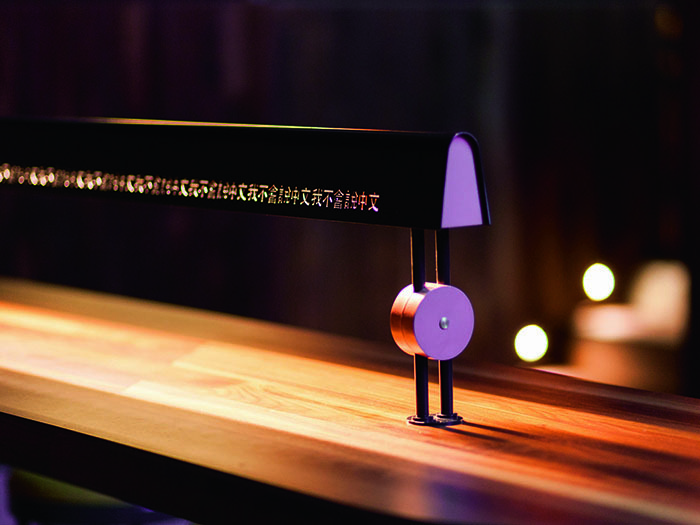 To complete the overall look of the lamps, Le Lampiste used Philips LEDs and drivers. In addition to the tabletop lamps from Le Lampiste, MRDK also brought in three RA suspension lamps from D’Armes, a selection of red Chinese lanterns and neon signs. 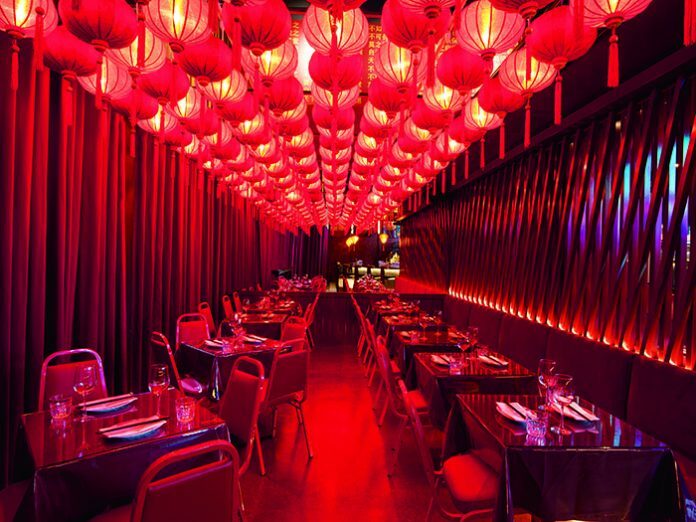 All fixtures are set to 2700K to bring warmth to the space and the named ‘red zone’ is filled with the 88 Chinese red lanterns, creating a dramatic and Hollywood-feel effect in the room. The glass-top tables glow with the reflections of customised neon pendants designed by D’Armes, a Canadian lighting design studio. The young design firm takes inspiration from the New-Wave movement and the visual universe of science-fiction films from the 1980s, which are both an evident influence in the Miss Wong project. D’Armes takes a green approach to lighting design, so the idea to use neon was not only an aesthetic choice but also a conscious environmental option for the design team. “We wanted the three RA pendants to be key lighting fixtures. They are cold cathode neon fixtures made out of hand-bent glass tubes, brass and painted steel (instead of aluminium to add extra weight on the silicone cables). The mix of gas and minerals inside the neon tube is uncommon and gave a warm light of 2800K-1800 lumens, with variable intensity,” explained Le Bourg. “The volume of the place was spectacular. We had to technically adapt our fixtures without altering their appearance. 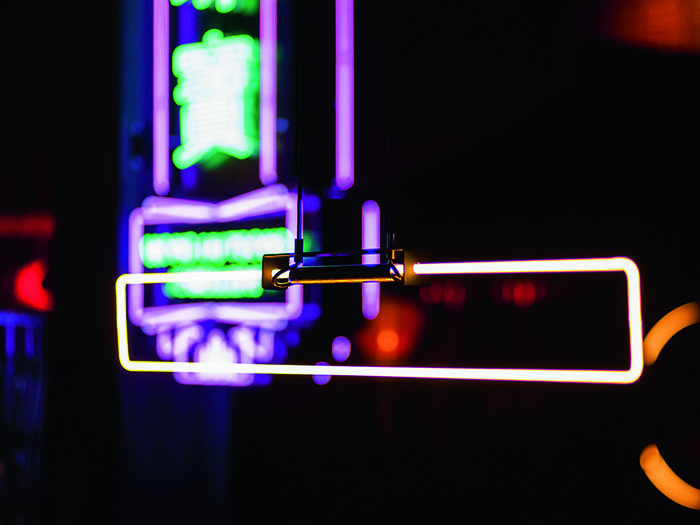 The decorative lights on this project are the storyteller of the Miss Wong. Our fixtures are extensions of this story. They are the bridge allowing people to enter the Miss Wong universe by creating proximity with their warmth and positioning,” he added.